I’ve always taken gambles when it comes to testing the ‘doneness’ of things, and this sense of lottery normally reaches a tension-filled crescendo just before lunch on Christmas day, when I’m stood in front of an enormous turkey, out of the oven, wrapped in foil, rested and I start to wonder … is it cooked properly, or is this going to be the day that we remember forevermore as the day I poisoned my entire extended family? I do the normal tests, stabbing the bird in the thickest part of the leg and studying the juices for any traces of blood, which is generally pretty inconclusive, and I’ve also tried my luck with one of those crappy £3 thermometers with a manual dial on the top, the ones where the needle never seems to get above the ‘rare lamb’ stage regardless of how long whatever the subject is has been cooking. I firmly believe that you could plunge a turkey into the heart of an erupting volcano for several hours, take a reading with one of those thermometers and be led to believe that it was still dangerously raw. There has to be a better way, and I’ve discovered that better way! In September! Months ahead of D-Day, sorry, I mean Christmas Day! The Superfast Thermapen thermometer is exactly that – it’s a kitchen probe that works really quickly, and very, very accurately. The most important attribute of any thermometer, and especially one that’s going to help you make decisions about whether something as potentially harmful as an undercooked chicken should be eaten or not, is accuracy. 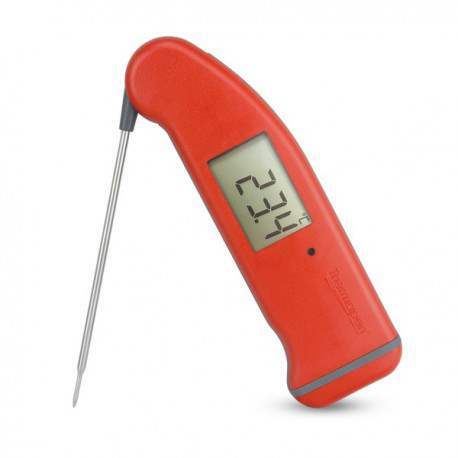 All Thermapen thermometers are hand calibrated before being shipped, and certified as such. The person who did the calibration even signs a certificate to say so. In my testing, which was not at all scientific, the Thermapen gave consistently predictable readings – a freshly boiled kettle read as expected, a glass of iced water plunged to zero. The user guide sets out some specific controlled tests to check calibration, and claims that accuracy is within 0.4c either way. The Thermapen is a very well designed piece of kit, with a couple of neat features to make life easier … it wakes up when you unfold the probe, for example, and goes to sleep after a set amount of time to save the battery. There’s a motion sensor that detects if the unit is being used, and stops it from sleeping. The display rotates depending on the orientation of the probe, so the cook always gets a clear view of the reading, and the display is backlit, depending on the level of ambient light. The Thermapen also comes in a range of colours – useful in a commercial kitchen where equipment is colour coded for meat, vegetables, dairy, etc. At £60, it’s an expensive tool, but the Thermapen is very good at what it does, and what it does is very important. It’s vital to know that the food you’re serving is fit for consumption, and £48 to avoid a bout of food poisoning doesn’t seem so much, when you think of it like that. A superb piece of kit. This thermometer was provided by ETI Ltd for the purposes of this review.